The Thrift World: Weaver's $20 gift certificate giveaway! 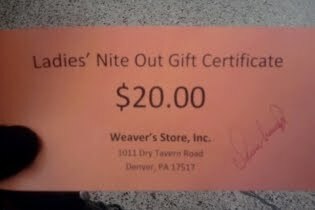 Thank you Weaver's for giving me a free $20 gift certificate for simply showing up at your store yesterday. No minimium purchase, no fine print, just plain free. The line out the door was CRAZY! I actually had a "wait, is this black Friday?"moment. Men - your chance is coming up. 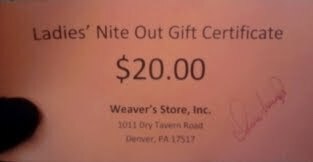 That giveaway is happening next Wednesday, December 22 at Weaver's Store in Fivepointville from 5-9pm. Just show up, be a man or do some fine convincing and you're golden. Don't miss it!